Student growth and improvement is on every educator's mind. A question one might ask is - "how much academic progress has a student made between two points in time?" The Galileo Student Growth and Achievement (SGA) report offers easy-to-use growth and achievement reporting to help track and improve student learning. Student growth is measured by the difference between the student's Developmental Level score at time one and time two. Time one is represented by an initial assessment, such as a pretest. Time two is represented by a second assessment, such as a benchmark or a post-test. 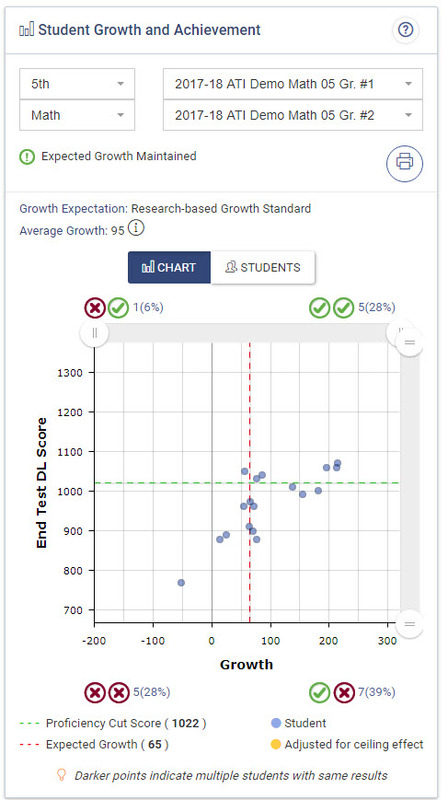 In this Galileo report, you can select the grade level and subject, test one and test two, which will then generate and display the results as a scatter plot with performance quadrants and a cut score. Plus, if selected, the report can be generated into a list-format listing individual students. The information in each quadrant has unique significance because educators can use this to create tailored instruction and intervention groups to help organize and monitor students for differentiated instruction. What other special features does the SGA report have? First, it's available to class-, school-, and district-level users, meaning that it has different levels of reports for each user level. For example, a district administrator can run SGA reports for their entire district, and even filter reports by student information and demographics. Second, the SGA data is dynamic meaning you can run it on any two benchmark assessments that have parameters. Third, the data will provide a growth categorization; for example, Expected Growth Exceeded, Maintained, or Not Maintained, which helps provide you a frame of reference of how your students are performing. With it's simple yet powerful display, the Student Growth and Achievement report gives you instant access to critical information necessary for instructional planning and academic success. Look out for the next Galileo Tours video highlighting the main tools and features of the SGA report. Something done successfully, typically by effort, courage, or skill is the definition of achievement. Achievement is a process, a process that involves many aspects and typically not completed in one step. One might say it takes a village to nurture and raise a child. We know it takes many to teach and enlighten a child. The cornerstone of educating encompasses many people dedicated with a single goal, improving student achievement. As part of the Navajo Nation in northeastern Arizona, Red Mesa Unified School District (RMUSD) was in need of finding a combination of leadership, impactful training, research-based tools, and instructional improvement technology to help guide their academic plan. In 2017-18 RMUSD contracted with the Center for Student Achievement to provide school improvement and turn-around services to all teachers and school leaders. As part of the services employed by the District was the implementation of the Galileo K-12 Online instructional improvement and effectiveness system by Assessment Technology Incorporated. With Galileo, the district had reliable and valid data to assist in decision making at the student, class, school, and district levels. After one full year of support, math scores for all grades increased by nearly 30 percentage points and the 2018 AzMERIT math passing rate for the Junior High was 33 percent higher than previous years. Case-study results are from RMJH’s Galileo benchmark assessments designed to track student progress and to predict how students might do on AzMERIT. Galileo assessments were administered during the 2017-18 school year using a pre-test/post-test design, including several benchmark assessments throughout the year. The case-study results are from RMJH’s Galileo benchmark assessments designed to track student progress and to predict how students might do on AzMERIT (Arizona’s standards-based assessment). How did RMUSD turn their schools around? Read the full article that details the importance of high-quality professional development, coaching, and data driven instructional planning in making a successful educational turn-around. The turn-around was not completed in one step. It was a series of steps and actions that took skill, further professional development, reliable/valid data, and a focused effort on the part of all participants. Galileo K-12 Online, a research-based and standards aligned Instructional Improvement and Effectiveness System, provides three complete functionalities in one integrated application. Integrating a comprehensive assessment system along with a Digital Curriculum Platform and Instructional Effectiveness technology all in one application supports ease of information access and use while at the same time saving money and staff time. Use of Galileo facilitates advancements in teaching strategies including the integration of curriculum and formative assessment and the implementation of instructional effectiveness initiatives across multiple content areas. Each functionality yields crucial data needed in educational decision making. This integrated application is backed by both responsive support and customized professional development. Nationally, ATI is a leading educational technology corporation and the first to integrate assessment, curriculum, and instructional effectiveness into a single system. The mission of the company is to create, distribute, and support technology to promote learning. ATI has several decades of experience in conducting research assisting educational programs to use assessment information in educational management, instructional improvement, and instructional effectiveness. A fundamental premise behind ATI’s work is that technology is crucial in promoting learning in the digital age. That is, technology supporting instruction and supporting the gathering of readily-available reliable data for decision making is crucial in promoting learning. ATI’s continuous state-of-the art research program influences the character and offerings of Galileo, a complete, standards-aligned, research- based, user-friendly instructional improvement and effectiveness system. For more information about ATI and Galileo contact us or check out our resourceful videos.